I made this pencil holder for my last project as the guest designer for Bombshell’s Miss April. 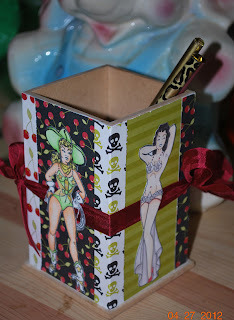 It was a fun project to do I used the Retro Cowgirls stamp and the Butterfly Queen Set for the images. Colored with the Spectrum Noir markers, I really like those. 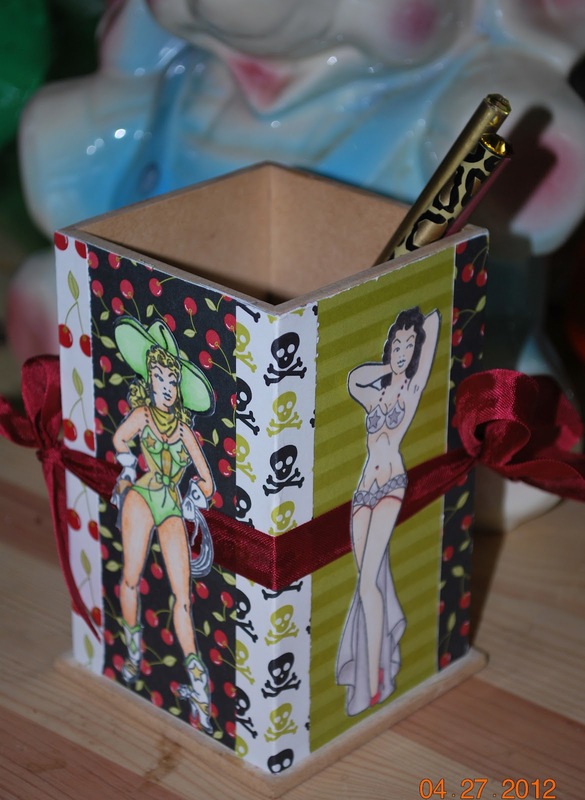 I covered the pressed wood box with 4 different scraps of paper from some of the projects I did this month. I wanted to have a memento of my month. 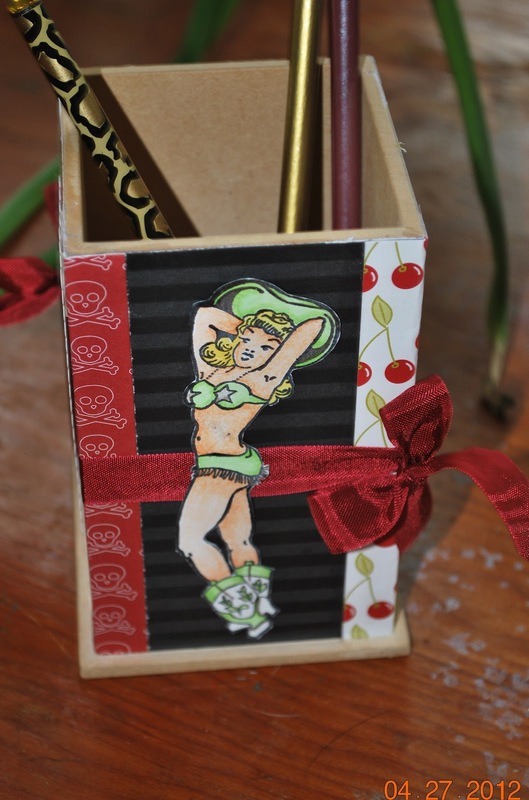 This will set on my craft desk to hold my pencils, something I’m always losing. Thank you for the opportunity to guest and play with your wonderful stamps. It was a very fun month. Now I would like you to all give Miss May Jennie Harris a wonderful “Welcome” She will bless you with such wonderful creations. Can’t wait to see what she has in store for us. You have been a dream to work with as a gt. Hope you plan to stick around and inspire us bombshells. 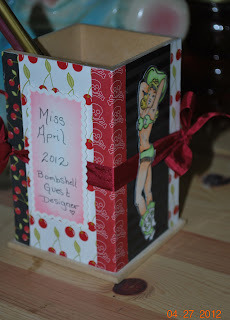 Love the idea of using scraps from your months projects as part of this project. Brilliant. Thank you. It was fun to play with all you lovely ladies as well. Thank you for the comments it so makes my day. Lovely project and it's useful too! 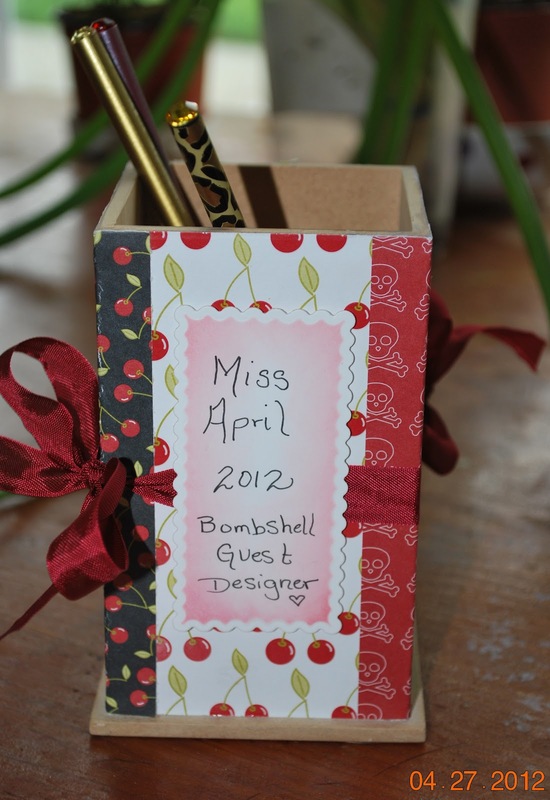 I hope you enjoyed your guest design gig!